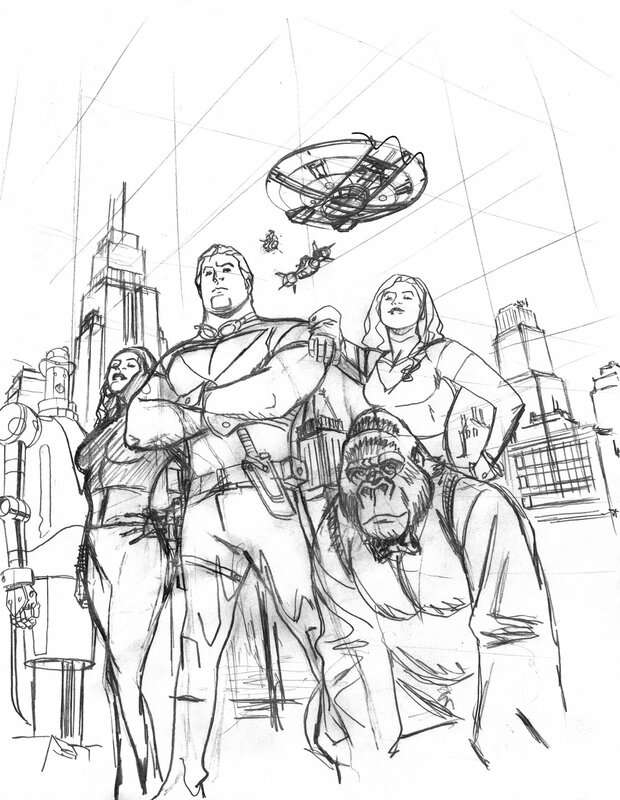 I just added four new pieces of art to the SprouseNet Art Emporium site: the Tom Strong prelim you see above, a Midnighter prelim, and two pencil pages I abandoned/rejected from Tom Strong and the Robots of Doom. I know–I still haven’t shown any art from the series, but these rejects provide a glimpse of what’s to come. In other news, I had a good birthday at the end of last month. I had a fun night of pizza and trivia games with Xan’s family–Xan’s mom has a birthday the day before mine, so it was a double celebration. On Thursday, Xan showered me with excellent gifts: season 4.5 of Battlestar Galactica on DVD, a brand new BSG “making-of” book, a rare Jason Falkner CD, and a great new art/messenger bag that I hope to be using for years! The bag has a compartment large enough for comic art pages, a padded laptop section, and about a million little pockets and holders for pens, pencils and other art supplies–I love it! The two of us then hit the road for a day full of geek-centric shopping, a long-standing birthday tradition for us. We started off by hitting a few local antique/vintage collectible malls. After the last post Xan wrote, it’s probably pretty obvious what she was hoping to find! I enjoy browsing through these kinds of places because I often find cool unexpected treasures, from old toys and other collectibles to antique art supplies. Mostly, it’s just good nostalgic fun–antique stores are in the Sprouse blood–my Dad’s family has owned and run an vintage furniture and collectible store for close to forty years–and the look and smell of such places sends me right back to summer vacations in Charlottesville. Anyway, Xan ended up coming away with a great bracelet form a vintage jewelry dealer and I kept the Battlestar Galactica theme of this birthday going when I found an old lighter just like the one used by Edward James Olmos in that series. One of my few remaining hobbies is collecting sci-fi movie and TV props, so the lighter was a really nice discovery! Next, we hit some used music and movie stores for some more rummaging, then it was on to a dinner of enchiladas and tacos at a local Mexican restaurant. I hate being (ugh!) middle-aged, but birthdays like this one help soften the blow! i'm so glad you had a nice bday, sweetie. i love you! as for that lighter, it's too bad it won't light……but then again, what does? Thanks Chris- sorry I didn't know you had a deal. If they're smart they won't let you out of that, but if they ever do, I'll hit you up again. at last got my copy of modern masters vol 21: chris sprouse…am so excited and arouse reading it..you make my day Chris..now learning how to simplified pencil and ink like you.